This Celestron eight-piece accessory kit enhances the performance of your telescope. 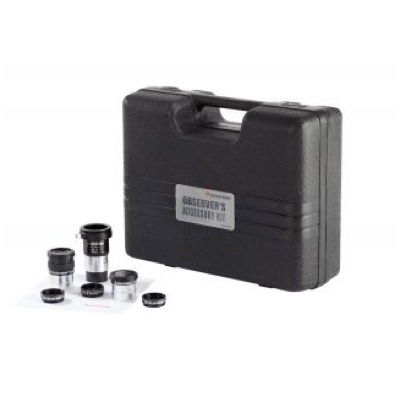 Includes two high-quality 1.25" Plossl eyepieces, a 2x Barlow lens that can be used visually or photographically, three eyepiece filters, a cleaning cloth, and a case. With two extra eyepieces and a Barlow lens, you-ll have four different magnifications to choose from. The Celestron Observer-s Accessory Kit is a great way to expand the functionality and enjoyment of your telescope. 2x Barlow Lens/T-Adapter - 1.25"
Eyepieces - The 17 mm and 6 mm Plossl eyepieces can be used in any telescope with a 1.25" focuser. Each eyepiece features a four-element design with a 52ôõ apparent field of view. The lenses are fully multi-coated to improve light transmission and protect the optics. The 17 mm Plossl eyepiece offers a nice medium magnification view in most telescopes, and the 6 mm Plossl provides high magnifications, great for the Moon and planets, especially when seeing conditions are good. 2x Barlow Lens/T-Adapter - The included versatile 2x Barlow will double the magnification of any 1.25" eyepiece. The 17 mm Plossl included in this kit will double in power, effectively becoming a 8.5 mm eyepiece, and the 6 mm will provide the magnification of a 3 mm. Any other 1.25" eyepieces you already have will also work in this desirable accessory, giving you even more magnification choices. Remember, high magnifications do not always produce clear, sharp results, especially on evenings of poor or moderate seeing conditions. Experiment to find the magnifications that are best for you and your telescope. T-threads are machined into the top portion of this Barlow lens, allowing a user to attach a camera with the addition of an optional T-ring. Instructions for attaching your camera are included with the Observer-s Accessory Kit. Filters - Colored filters bring out certain details on a planet-s surface or its cloud structure. Both planetary filters, as well as the Moon filter, can be used on any 1.25" eyepiece with the proper filter threads. Just screw one onto your eyepiece of choice and slide it into the focuser. The Moon filter is one of the first accessories most new amateur astronomers buy, and for good reason! It helps block out a portion of the light the Moon sends into your eyepiece so you can see details better. You can also try this filter on Venus; it blocks enough glare so that the planet-s phases can more easily be seen. Cleaning Cloth & Case: Keep the microfiber cleaning cloth stashed in your Observer-s Accessory Kit so that it will always be handy. Use it to safely remove fingerprints and smears from your optics without leaving residue behind. Remember to blow or brush any dust particles off of your optics before rubbing them with the cloth. The black plastic carry case has die-cut foam inside to protect and cushion your accessories. Keep each one in its appointed place when not in use and you-ll keep them looking and performing like new. The case is large enough to carry a few extra accessories safely.